A century of anarchism - biography of Dutch anarchist and anti-militarist Arthur Lehning. 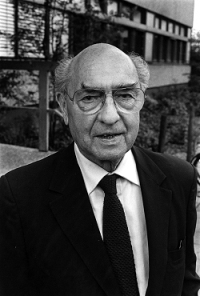 Arthur Lehning was born on 23rd October 1899 at Utrecht in Holland. He studied economic science at Rotterdam then at Berlin. From an early age he got to know the ideas of antimilitarism, anarchism and syndicalism. At the beginning of the 20s he first read a book by Mikhail Bakunin. He met anarcho-syndicalist Rudolf Rocker in Berlin and got to know anarchists Alexander Berkman and Emma Goldman who had come there from Russia. He joined the defence committee for the anarchists and Socialist-Revolutionaries who were being persecuted and imprisoned in the Soviet Union, now the Bolshevik Party had seized power following the 1917 Revolution. In 1922 he became the Berlin correspondent of the Anti-Militarist Bureau (IAMB) founded in 1921 in the Hague, and became friends with Georg Friedrich Nicolai, antimilitarist, professor and head doctor of the Charity Hospital in Berlin. In 1923 Mussolini was only just preparing for his rise to power to crush the powerful Italian workers’ movement, Hitler’s Munich putsch had not happened and already Lehning was writing an article ‘Roots of German Fascism’. He also brought out his first pamphlet Social-Democracy and the War, a fierce critique of German Social-Democrat involvement in World War I, which he compared to Marx’s support for the Franco-Prussian War. He developed and supported the theory of the general strike as a weapon to halt war, and advanced the need for the creation of factory and workplace committees to take over production. He was convinced that an antimilitarist general strike in all countries involved in a war would unleash the social revolution. Whilst not a pacifist, his strong support of antimilitarism had many connections with the Dutch Tolstoyanism (so-named after the pacifist Christian anarchism of author of War and Peace Leo Tolstoy) and pacifist anarchism as most importantly represented by Bart de Ligt and Clara Meijer-Weichmann. Lehning was also involved in organising activities for anarcho-syndicalism, joining the International Workers’ Association founded in 1922 which gathered the anarcho-syndicalist organisations at a world level. From 1927-1934 with Albert de Jong, Augustin Souchy and Helmut Rudiger, he ran the press service of the International Anti-militarist Commission, a fusion between the IWA-AIT’s antimilitarist committee and the IAMB. The bulletin they produced contained information about antimilitarist struggles and was distributed to 800 papers and magazines. Fierce debates took place within the Commission over the means of defending the revolution. Lehning and de Jong rejected the idea of forming militias, counterposing the ideas of the strike, the boycott, non-payment of taxes, passive resistance and refusal to collaborate. The great majority of the IWA-AIT disagreed with these views and called for armed defence against fascism in Italy and Germany, such as that carried out by the Italian Arditi del Popolo. Between 1932 and1935 he worked on the Secretariat of the IWA-AIT alongside Rudolf Rocker, the Russian Alexander Schapiro and Augustin Souchy. He visited Spain where the anarchist movement was very strong, and it was to Madrid and then Barcelona that the secretariat was transferred, with the rise of Hitler and the destruction of the German workers’ movement, including the anarchists. Lehning gave one more public meeting between the taking of power by the Nazis and the Reichstag fire, before fleeing to Holland. Here he set up the International Institute of Social History in Amsterdam which gathered together many archives from the workers’ movement and the international anarchist movement. He had special responsibility for the south eastern Europe and anarchist collections. Alongside his anarchist activity, Lehning was involved in cultural activity from 1923-1933. In Paris in 1924, he discovered the Cubists, the Constructivists, the Expressionists and the Futurists. Enthused by art and literature, he set up the artistic review i 10 between January 1927 and June 1929., influenced by and influencing the Bauhaus and De Stijl artistic currents. He was its sole editor. The review attracted an awesome range of collaborators, like the artists Mondrian, Lissitsky, Kandinsky, J.P. Oud, the founder of De Stijl, and Moholy-Nagy who wrote on film and photography. Edited in French, English, German and Dutch the magazine opened its pages to all the new artistic currents. Lehning believed that a total revolution in culture and everyday life was necessary to ensure a successful revolution. Dadaists like Arp and Schwitters wrote for it, as did Marxian philosophers like Ernst Bloch and Walter Benjamin, writers like Upton Sinclair, architects like Le Corbusier and Gerrit Tietveld, Helene Stocker, a champion of women’s rights, and anarchists like Rocker, Nettlau, and de Ligt. The magazine was heavily involved in mobilising support for the condemned Italian-American anarchists Sacco and Vanzetti. From April 1939, the International Institute of Social History was forced to move, and Lehning worked for its Oxford branch to where the most sensitive files had been transferred after the Munich agreement. In 1957 he returned to Germany. He continued to work for the Institute, editing the collected works of Bakunin, which were published in France in 1976 under the title Archives Bakounine. For the French publishing house Spartacus he wrote Anarchisme et Marxisme dans le Revolution Russe in 1971. He also brought out the book Michel Bakounine et les autres in 1976. Many of his major scholarly articles were collected together in the book From Buonarotti to Bakunin in 1970. He survived the twentieth century by one day, dying on 1st January 2000 in Le Plessis, France.